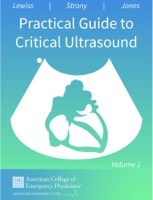 The Practical Guide to Critical Ultrasound iBook in 2 volumes is a free resource for point-of-care users caring for patients in emergency and critical care environments. We designed this interactive image and narrated video focused book to be a quick reference and a just-in-time learning tool. This iBook has three unique aspects. We begin the book with a series of narrated “How to Scan” videos for common ultrasound applications. The two chapters at the end of volume 2 collate landmark publications for the field. The critical care ultrasound protocol chapter provides a nearly complete set of reference information as providers consider an organized approach to the emergency and critical patient. The final society protocol chapter assists the reader with the most up-to-date specialty endorsed standards and guidelines. • There are chapters devoted to a specific topic. These follow the general outline of Clinical Indications, Etiology, Anatomy and Physiology, Sonographic Windows, Sonographic Findings, Sonographic Differential, Pearls and Pitfalls, Sonographic Sequential Protocol, and 5 selected References and Key Reading. • There are chapters devoted to a specific procedure. These follow the general outline of Background/Introduction, Indication(s), Scanning Essentials, Technique, and selected References and Key reading. We are very proud of the extensive number of contributors nationally and internationally. We acknowledge and welcome that not all chapters are the same. The tone and the approach differ in small ways. Authors had a bit of poetic license, where they literally used their own voices. The many video contributors made an otherwise impossible encyclopedia of findings possible. Ultimately, we hope the iBook serves patients. We created a tool for providers to continue their journey to patient-centered care. Clinicians across the globe are utilizing point-of-care ultrasound to improve care for critically ill and injured patients. This spans the prehospital environment, emergency department, inpatient, and intensive care arenas. Rapid innovation in technology, protocols, and training have created the opportunity for an ever increasing number of providers from different specialties and professions to utilize point-of-care ultrasound for patient diagnosis, monitoring, and procedural interventions.